4. Knock, Knock, Who's Dead? Being pope used to require real balls  and the one chosen actually had to prove it! Somewhere in the Vatican Museum is said to be a most unusual throne. Original Caption: "The sedia stercoraria in the Vatican Museum. It is kept in a small room with no mention of its infamous past role." "It's a strange object. There is, for a start, something curious about its proportions. 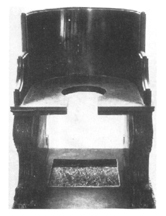 The seat is very high and has cut into it a keyhole shape, the stem open to the front. On closer examination it could be an elderly, rather grand commode, once used by popes.... However, the chair back is at a curious reclining angle, far too relaxed, it would seem, for any practical bodily movement. And the legs, too, are unusual... leaving the centre, under the keyhole, open and uncluttered." 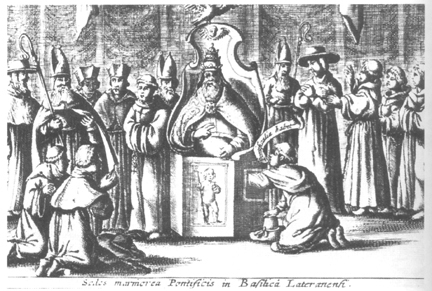 Original Caption: "An illustration that accompanied an account by the Swedish traveller Lawrence Banck, of the coronation in 1644 of Pope Innocent X. Innocent is seated in the sedia stercoraria and having his testicles felt by a young cardinal as a way of ensuring that he is a man." The man appears to be exclaiming in Latin, "The pontiff has them," much to the relief of everyone. Medieval eyewitness accounts give no doubt that at one time, this chair and others like it were indeed an important part of the papal coronation ritual. But why should the cardinals be so concerned that they would go through the embarrassment of publicly probing their new boss to demonstrate that the pope is indeed a male? (It wasn't done quietly, either. If all was as expected, the examining cardinal was supposed to call out, "He has two balls, and they are well hung.") An odd tradition even for such a woman-hating church as that of Rome  unless, of course, they had good reason to worry. Unless, that it, there once was a pope who wasn't a member of the boys' club. Interestingly enough, there are ancient and persistent legends, vigorously denied to this day by the Church, about such a feminine papacy. "Pope Joan," she is called, and her story is recorded by some 500 medieval chronicles. She is said to have been an English woman posing as a man who entered the Church and became a great teacher, bishop and was ultimately elected pope, as John VIII in 855. She supposedly reigned for two years, secretly taking a lover. Her secret was finally revealed when she gave birth to a child in the street during a papal procession, whereupon she and her lover were either stoned or hung upon the spot. The popes, it is said, have superstitiously avoided taking that same route ever since. Monuments were made, but later destroyed or altered, especially after the Reformation, when her tale was used to further embarrass Rome. Pope Joan, if she existed, still exerts a certain fascination. The Tarot card known as The Popess may well be a reference to her. There have been many books and plays about her story, but apparently no films. It is not known when  or even if  this strange custom was discontinued. It could go on, for all we know, as one of the secret rituals of the electoral conclave. In the nearly two millennia of the title of Roman pontiff having been a Christian one, many customs have come and gone. For instance, the papal tiara, no longer seen, was an item popes once wouldn't be caught dead in public without not long ago. A tall, grandiose conehead-shaped triple-layered crown, it grew through the centuries from a simple beehive or conical shape much like a dunce-cap. Originally a "simple hat made of white cloth in the shape of an elongated helmet, which may have been derived from the diadem that, according to legend, Constantine gave to Pope Sylvester." . Perhaps, but the papal public relations office once also claimed that Constantine had also most generously donated Italy and most of Europe to the pope, too, a claim proven to be fake by no less than a papal secretary during the Renaissance, so perhaps pious PR should not be depended upon. Used in coronations and processions rather than religious ceremonies, the tiara proudly proclaimed the temporal power of the pope as rulers over the Papal States for six hundred years. Lost during the reunification of Italy in the 19th century, all that remains of the pope's earthly kingdom is the tiny sovereign state of the Vatican. It is that sovereignity which allows nations to accredit ambassadors and conduct treaties with the Holy See. Microscopic though it is, it is the political independence of the Vatican that gives the pope more real clout than say, the Dalai Lama. Yet despite its obvious political meaning, religious symbolism has been ascribed to the triple crown, as one might expect. Maybe the three rings "represent the threefold power of the Supreme Pontiff as priest, pastor, and teacher." Most authorities, however, seem to think the bands represents his supreme authority over the Church Militant, Penitent, and Triumphant. Or, in other words, ultimate power over all Catholics, living or dead, on Earth, in Purgatory, or in Heaven. Whatever the allegorical allusion, the big heavy hat obviously marked the popes' claim to ultimate control over a lot more than just the choicest real estate in Italy, in fact nothing less than absolute ascendancy over all Christendom. For you see, kings have one crown, emperors a double one, but only the Vicar of Christ gets three. The tiara of Pope Pius IX. Paul stopped publicly wearing them after Vatican II, preferring to adopt a more pastoral appearance by wearing a bishop's miter instead. This was continued by John Pauls I and II. Benedict XVI also hasn't dusted it off, though there was some speculation Ratzinger might revive the custom. He could still resume its use later. After all, there are still a few in the warehouse. And the Roman Church has never renounced any claim it has ever made  including that of Boniface's. 2. Pontian (230-235). Allegedly resigned after being exiled to the mines of Sardinia during persecution of [Roman Emperor] Maximinus Thrax. 3. Marcellinus (296-304). Abdicated or was deposed after complying with [Roman Emperor] Diocletian’s order to offer sacrifice to pagan gods. 4. Martin I (649-655). Exiled by [Byzantine] Emperor Constans II to the Crimea. Before he died, the clergy of Rome elected a successor, whom he appears to have approved. 5. Benedict V (964). After one month in office, he accepted deposition by [German] Emperor Otto I. 7. Gregory VI (1045-46). Deposed for simony by [German Emperor] Henry III. Source: Patrick Granfield, “Papal Resignation” (The Jurist, winter and spring 1978) and J. N. D. Kelly, The Oxford Dictionary of Popes (1986). Items in brackets as well as italicized comments in parentheses added by me -ed. Ancient traditions surround the end of a papal reign as well. Even the matter of determining if the pontiff had passed to his heavenly reward has long been regulated by custom. At least up until middle of the last century, no fancy monitors or esoteric medical tests were needed. It was done simply by hitting the pope on the head with a hammer. Cardinal Eduardo Martínez Somalo holds the title of Camerlengo, or chamberlain, of the Holy Roman church, and that only acquires substance the moment the Pope draws his last breath. At that point, the Cardinal Camerlengo becomes a sort of interim administrator, though in no sense an "acting pope". His first duty will be to decide that the Pope really has died. 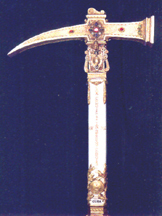 Traditionally, this has been done in the presence of the papal master of ceremonies and various other members of the pontifical household, by tapping the Pope on the forehead with a silver hammer and calling out his baptismal name three times to see whether there is any response. According to various sources, the forehead tapping, done as recently as the death of John XXIII, has sadly been discontinued. In the rules put forth by John Paul II and apparently followed, covering his face with a towel was the decreed method of acknowledging his passing. However, the ring was still smashed  the medieval equivalent of changing passwords. John Paul II did not get all his last requests. It was said he had asked to be buried in the earth; however, the cardinals decided that a choice spot in the Vatican grotto was more appropriate to their latest superstar and he was given the favored spot occupied by John XXIII, who was moved to another location. Truly do the Romans say, "There's nothing so dead as a dead pope." Other papal burial traditions forbid autopsies but promote displaying the corpse in state. Often the latter tradition has proven most distressing in those cases when the pope died in summer and decay quickly set in.